The Trinell Entertainment makes home on the range look so alluring. 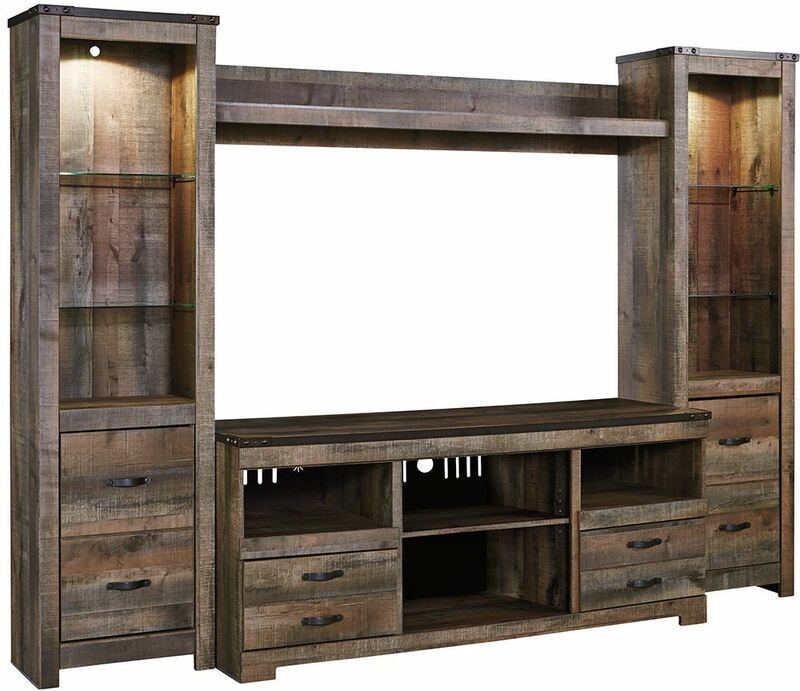 The style is earthy, yet clean and sophisticated, with a rustic finish, plank details and nailhead trim that are a homage to reclaimed barn wood. By removing the adjustable center shelf, you can pop in the optional LED fireplace for instant warmth and romance. (fireplace not included) The stand includes side roller glides for smooth operating drawers and is compatible with the W100-41 digital sound. The piers feature open glass shelving for display with display light and doors for storage. Topped off with a matching bridge that's perfect for display area. The Trinell Entertainment makes home on the range look so alluring. Handles feature nailhead trim in a dark bronze color.